Iolanda Lancio by Albesa (Lugar). Hips 7:7. Haemophilia 'A' clear. ALBESA are a family of fur kids nestled in the heart of the beautiful Lincolnshire Fens, surrounded by open fields and woodland. Long Coated German Shepherds and Pugs. Our dogs are kept as first and foremost family members. We take great pride in rearing our puppies and give them every opportunity to grow into healthy well adjusted adults. A pleasant temperament is of the up most importance. We only breed from dogs with below the BVA national average hip score. Our stud boys are Haemophilia tested ‘A’ clear. We pride ourselves on the quality of our dogs (we do not breed for size or colour) and believe strongly in genetic testing. When purchasing a puppy it is always advisable to buy from a breeder that carries out such tests, hopefully ensuring a healthier dog. All our puppies will leave us Kennel Club Registered, Insured, Wormed and Micro-Chipped. New owners will be given a puppy pack that includes a 5 generation pedigree, a caring for your new puppy book, food, toys, puppy toilet training pad's and a comfort blanket. Plus loads of leaflets with advice on feeding and caring for their new puppy. 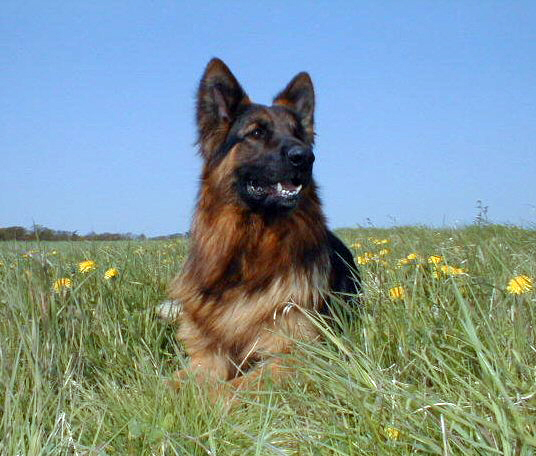 ALL our German Shepherd puppies have both export and breeding restrictions placed on them (these will not be removed ). This is to try and ensure that our puppies do not fall into the wrong hands. New owners will be required to sign a contract agreeing to these and other terms. I will always be here throughout your dogs life to offer help and support, I do insist however (this is also included in our contract) that if for any reason during your dogs life due to a change in circumstances, family break up, move etc, that If you need to re-home your puppy/dog that he/she must be returned back here to me. This way I can ensure that my dogs are safe and well cared for. Rearing a puppy is not easy and careful consideration must be given before any decision is made. A puppy will require lots of your time and money. I strongly recommend training your puppy at an early age, as both training and socialization are paramount to produce a well adjusted adult. Genuine, responsible animal loving homes are always welcomed, and if ever I can help or advise in any way then please call me (Becky) on 01673 857176 or email me using my simple contact form. I hope you enjoy my site and find my Fur Kids as wonderful as I do.